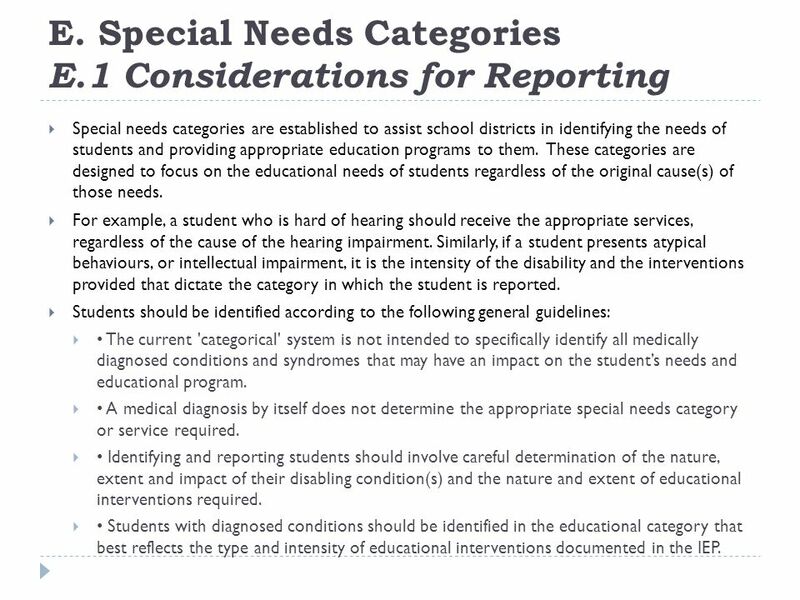 Special needs categories are established to assist school districts in identifying the needs of students and providing appropriate education programs to them. These categories are designed to focus on the educational needs of students regardless of the original cause(s) of those needs. For example, a student who is hard of hearing should receive the appropriate services, regardless of the cause of the hearing impairment. 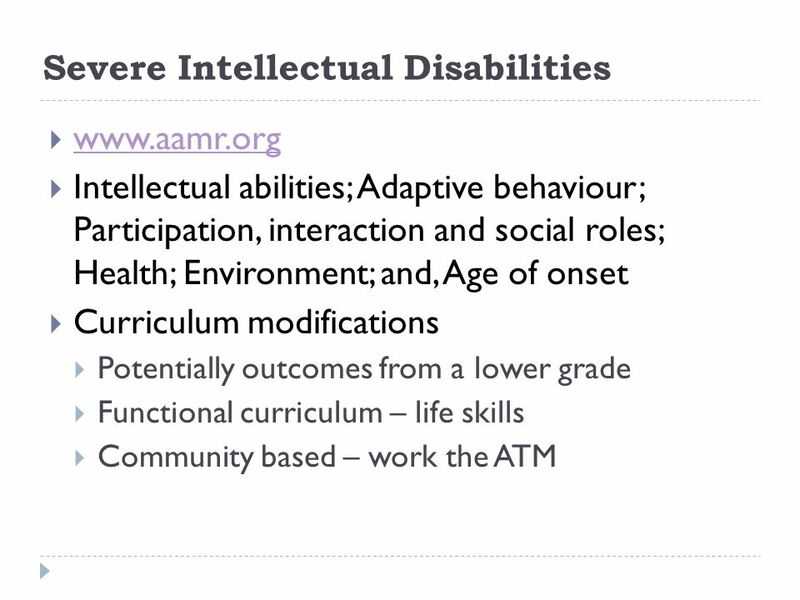 Similarly, if a student presents atypical behaviours, or intellectual impairment, it is the intensity of the disability and the interventions provided that dictate the category in which the student is reported. 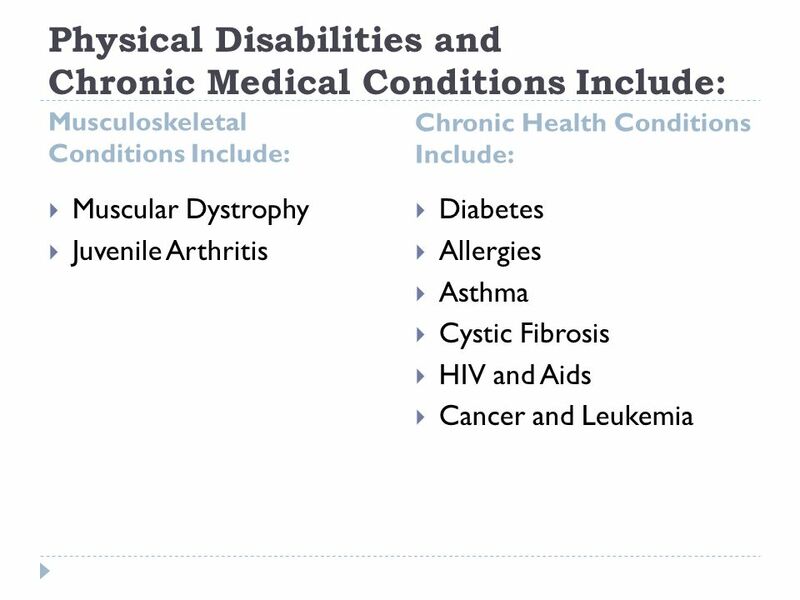 Students should be identified according to the following general guidelines: • The current 'categorical' system is not intended to specifically identify all medically diagnosed conditions and syndromes that may have an impact on the student’s needs and educational program. 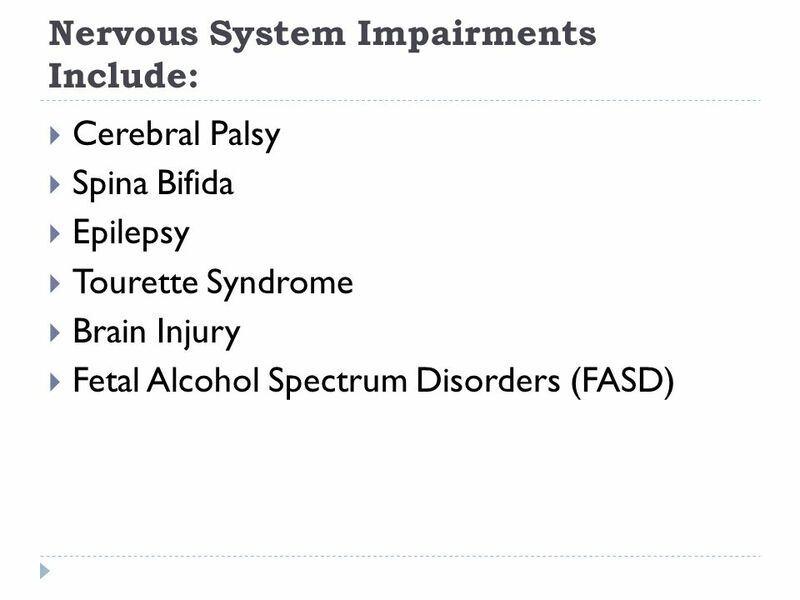 • A medical diagnosis by itself does not determine the appropriate special needs category or service required. • Identifying and reporting students should involve careful determination of the nature, extent and impact of their disabling condition(s) and the nature and extent of educational interventions required. 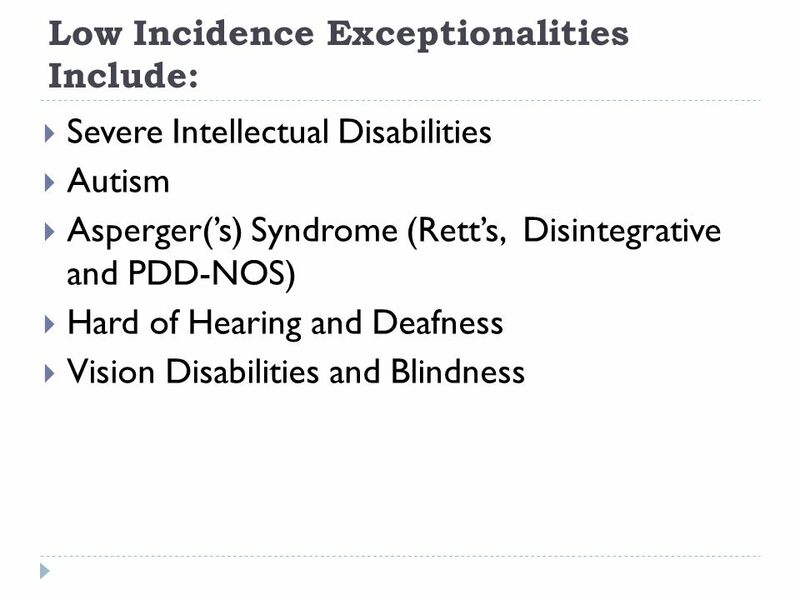 • Students with diagnosed conditions should be identified in the educational category that best reflects the type and intensity of educational interventions documented in the IEP. Special Ed. 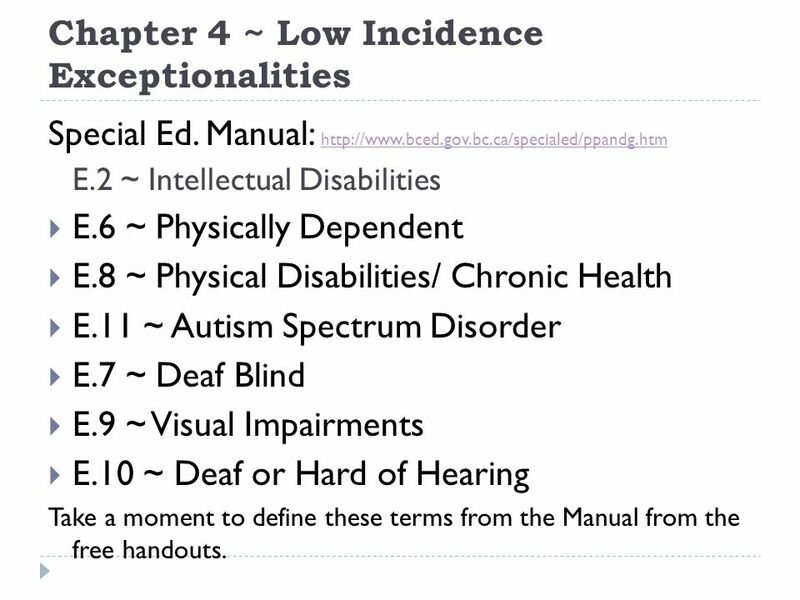 Manual: E.2 ~ Intellectual Disabilities E.6 ~ Physically Dependent E.8 ~ Physical Disabilities/ Chronic Health E.11 ~ Autism Spectrum Disorder E.7 ~ Deaf Blind E.9 ~ Visual Impairments E.10 ~ Deaf or Hard of Hearing Take a moment to define these terms from the Manual from the free handouts. 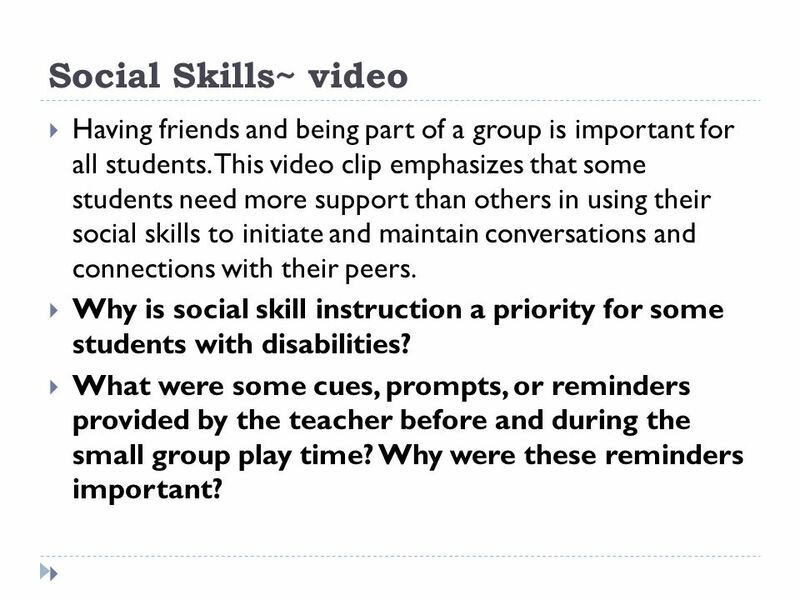 8 Social Skills~ video Having friends and being part of a group is important for all students. This video clip emphasizes that some students need more support than others in using their social skills to initiate and maintain conversations and connections with their peers. 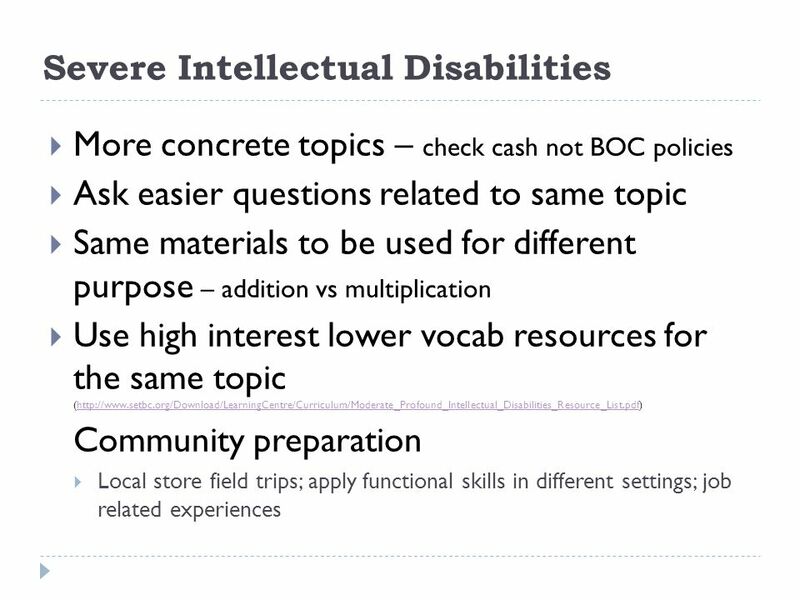 Why is social skill instruction a priority for some students with disabilities? What were some cues, prompts, or reminders provided by the teacher before and during the small group play time? Why were these reminders important? 1. Use visually oriented materials, demonstrations and aids (slides, diagrams, videos, charts); write information when necessary. 2. Make sure students are attending; provide short, clear instructions; use a buddy system. 3. Speak clearly and normally; do not exaggerate the pronunciation of words. 4. Keep your face visible to the students; avoid frequent movement around the classroom, turning your back on students while talking, and standing in front of a bright light source. 5. Use gestures and facial expressions; trim beards and moustaches if such facial hair interferes with speech reading. 6. Check with students to confirm if they are understanding what is being discussed or presented; encourage students to request clarification and to ask questions. 7. 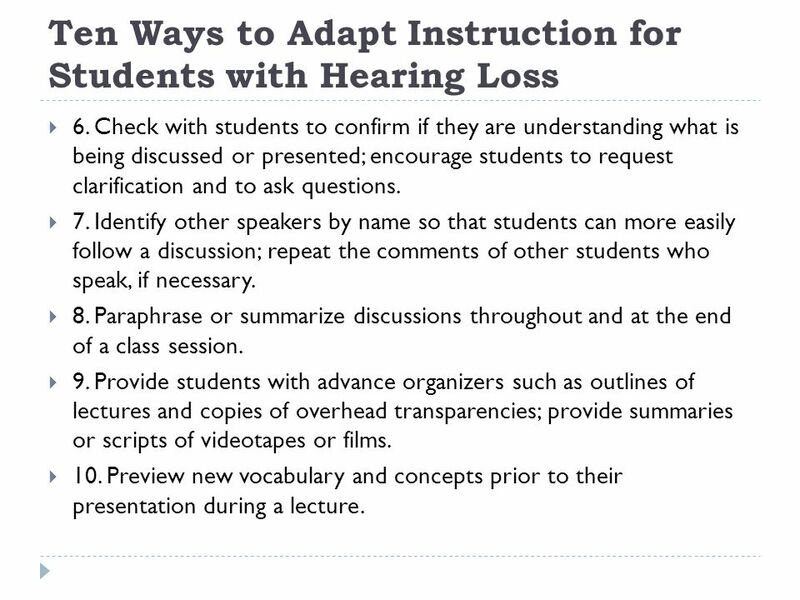 Identify other speakers by name so that students can more easily follow a discussion; repeat the comments of other students who speak, if necessary. 8. Paraphrase or summarize discussions throughout and at the end of a class session. 9. Provide students with advance organizers such as outlines of lectures and copies of overhead transparencies; provide summaries or scripts of videotapes or films. 10. Preview new vocabulary and concepts prior to their presentation during a lecture. During this video, imagine that Star is your student. What would she need to be successful? How is Star similar to and different from students we have seen in other video clips? 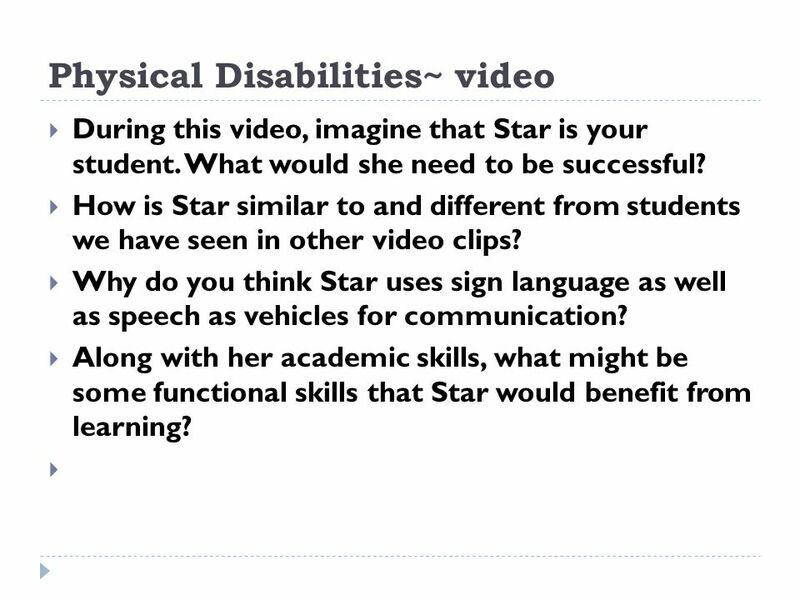 Why do you think Star uses sign language as well as speech as vehicles for communication? Along with her academic skills, what might be some functional skills that Star would benefit from learning? 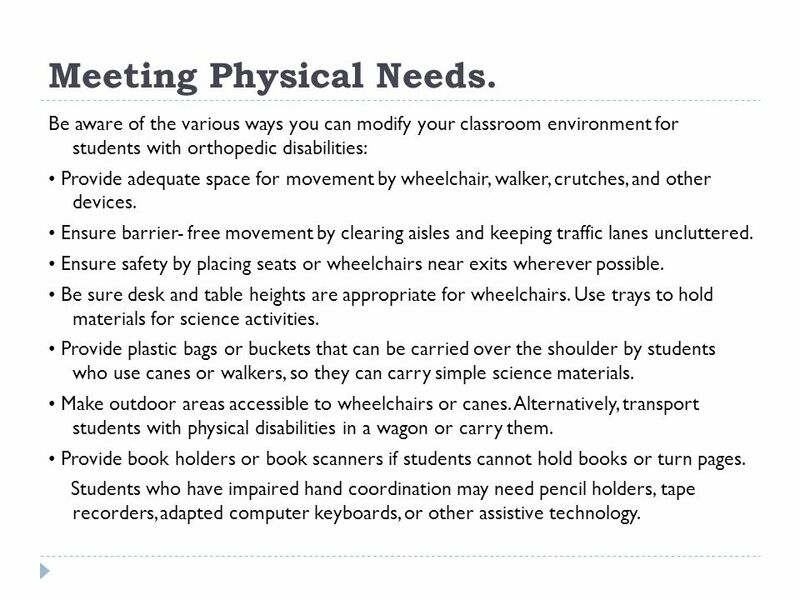 Be aware of the various ways you can modify your classroom environment for students with orthopedic disabilities: • Provide adequate space for movement by wheelchair, walker, crutches, and other devices. • Ensure barrier- free movement by clearing aisles and keeping traffic lanes uncluttered. • Ensure safety by placing seats or wheelchairs near exits wherever possible. • Be sure desk and table heights are appropriate for wheelchairs. Use trays to hold materials for science activities. • Provide plastic bags or buckets that can be carried over the shoulder by students who use canes or walkers, so they can carry simple science materials. • Make outdoor areas accessible to wheelchairs or canes. Alternatively, transport students with physical disabilities in a wagon or carry them. • Provide book holders or book scanners if students cannot hold books or turn pages. Students who have impaired hand coordination may need pencil holders, tape recorders, adapted computer keyboards, or other assistive technology. 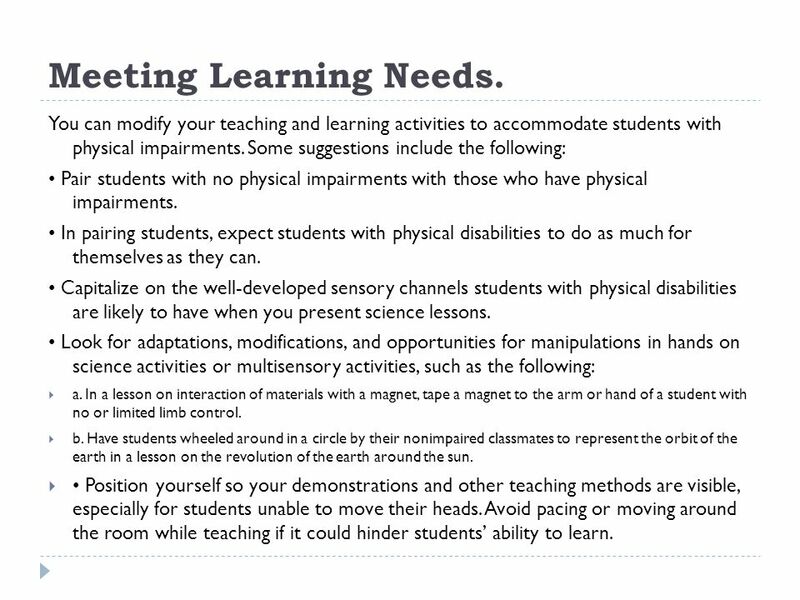 You can modify your teaching and learning activities to accommodate students with physical impairments. Some suggestions include the following: • Pair students with no physical impairments with those who have physical impairments. 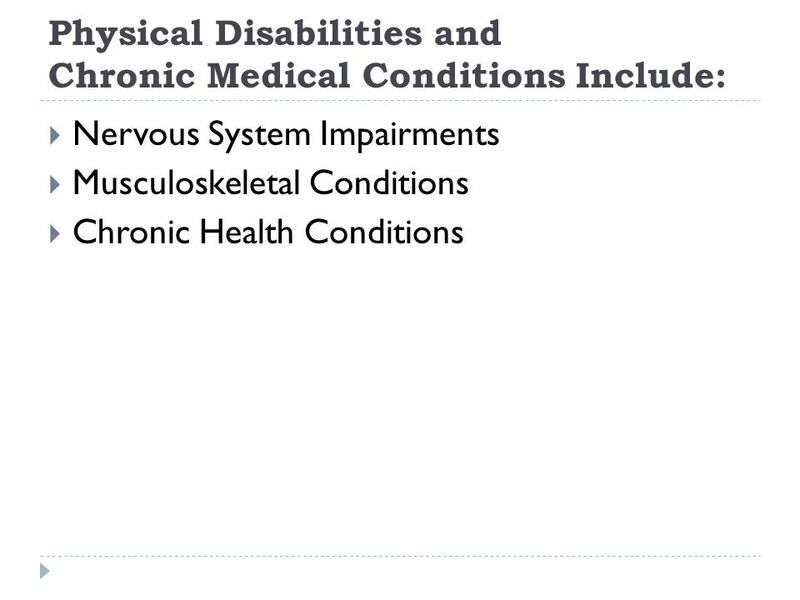 • In pairing students, expect students with physical disabilities to do as much for themselves as they can. 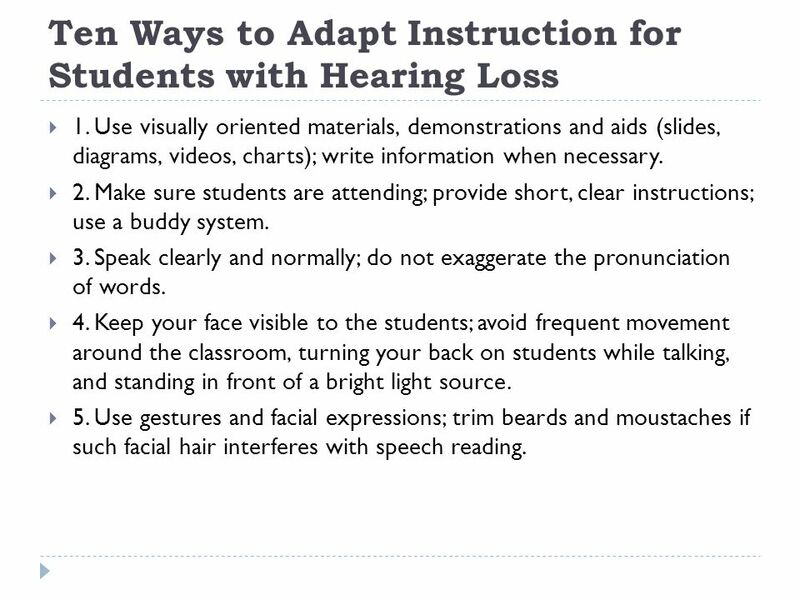 • Capitalize on the well-developed sensory channels students with physical disabilities are likely to have when you present science lessons. • Look for adaptations, modifications, and opportunities for manipulations in hands on science activities or multisensory activities, such as the following: a. In a lesson on interaction of materials with a magnet, tape a magnet to the arm or hand of a student with no or limited limb control. b. Have students wheeled around in a circle by their nonimpaired classmates to represent the orbit of the earth in a lesson on the revolution of the earth around the sun. • Position yourself so your demonstrations and other teaching methods are visible, especially for students unable to move their heads. Avoid pacing or moving around the room while teaching if it could hinder students’ ability to learn. 1. Which of the characteristics of each student are most likely to impact on learning? 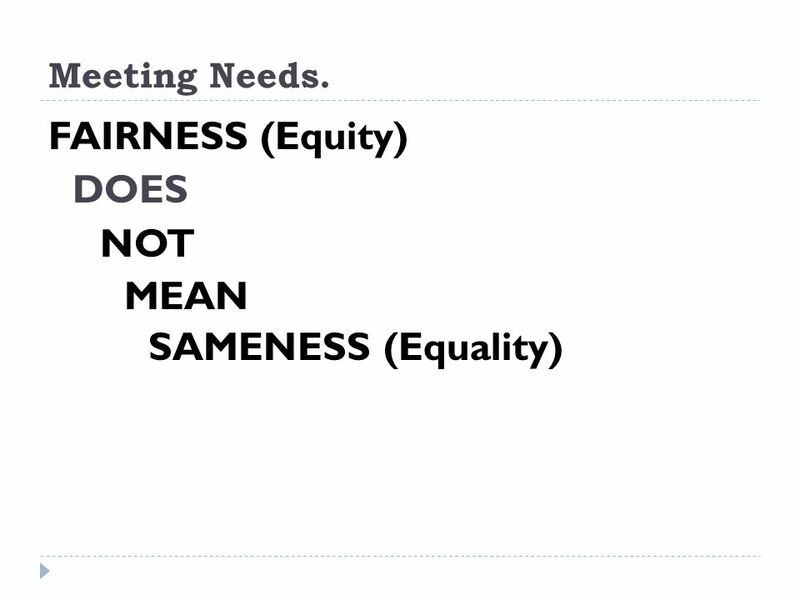 What learning needs are implied by these characteristics? 2. With such a range of learning needs, what do exceptional students like Pam and Brittany have in common? 3. How frequently is a teacher likely to be teaching a student with each of these exceptionalities? 4. What forms of differentiated instruction and types of adaptations does each of these students need in order to be included in the social life and the learning activities of the classroom? 5. What community resources can a teacher draw on to supplement in-school resources to teach each of these students? Level 1: Use the same activity, objective, and materials as for the rest of the class when the goals from the student’s IEP can be addressed within regular curriculum and lessons. For students with a sensory impairment, access can be through Braille or sign language. Example: Student participates in the counting and numeral writing activity using the same materials and under the same expectations of performance as her peers. 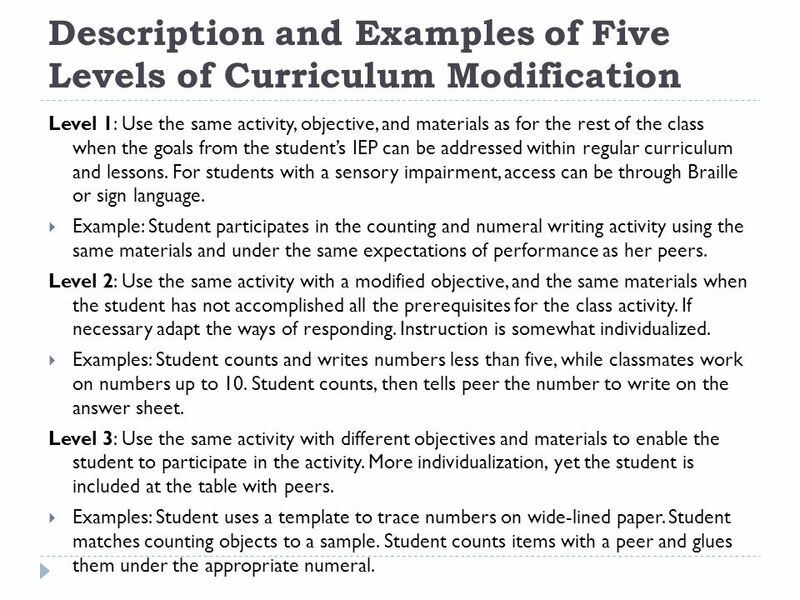 Level 2: Use the same activity with a modified objective, and the same materials when the student has not accomplished all the prerequisites for the class activity. If necessary adapt the ways of responding. Instruction is somewhat individualized. Examples: Student counts and writes numbers less than five, while classmates work on numbers up to 10. Student counts, then tells peer the number to write on the answer sheet. Level 3: Use the same activity with different objectives and materials to enable the student to participate in the activity. More individualization, yet the student is included at the table with peers. Examples: Student uses a template to trace numbers on wide-lined paper. Student matches counting objects to a sample. Student counts items with a peer and glues them under the appropriate numeral. Level 4: Use the same theme but different tasks and objectives when this enables the student to participate in curriculum activities, thematically related to the peers’ lesson. The focus is on core IEP goals (e.g., social, motor, cognitive) that can be embedded in the classroom curriculum. Instruction is highly individualized; the student remains in the classroom. Examples: Student uses a computer to work on numeric concepts like more and less. Student traces textured numbers with her finger and then places them inorder. Student hands out snacks to classmates to reinforce the concept of one-to one correspondence. 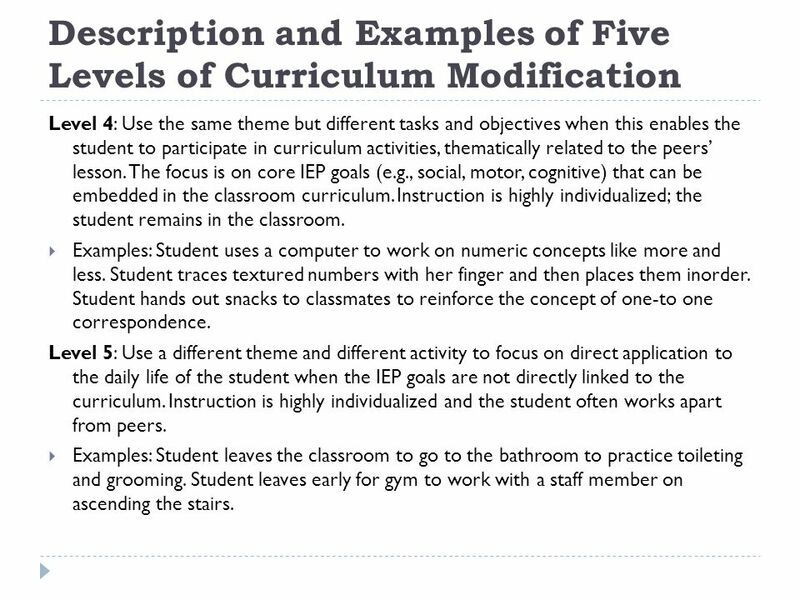 Level 5: Use a different theme and different activity to focus on direct application to the daily life of the student when the IEP goals are not directly linked to the curriculum. Instruction is highly individualized and the student often works apart from peers. Examples: Student leaves the classroom to go to the bathroom to practice toileting and grooming. Student leaves early for gym to work with a staff member on ascending the stairs. 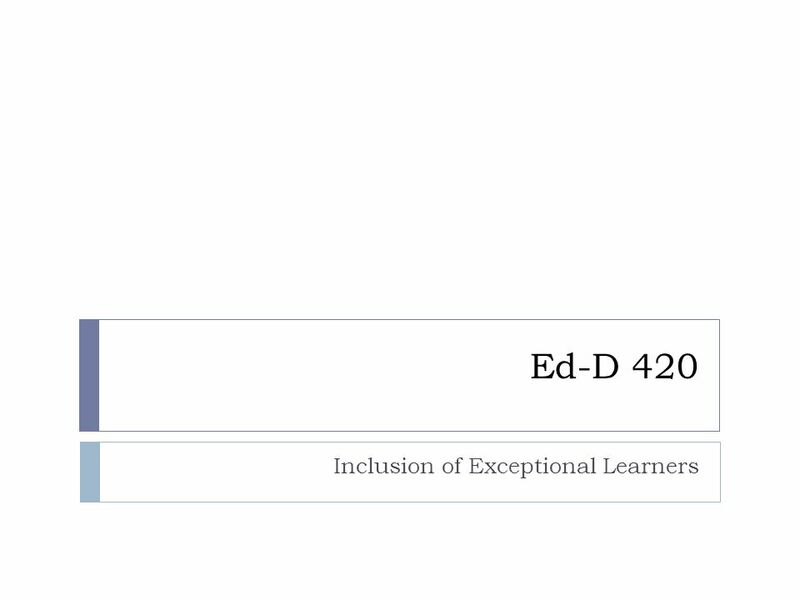 Download ppt "Inclusion of Exceptional Learners"
Unit 4 Using ICT to support SEN Special Needs and ICT ICT has been recognised as a valuable tool in the area of SEN for a long time. In addition to the. 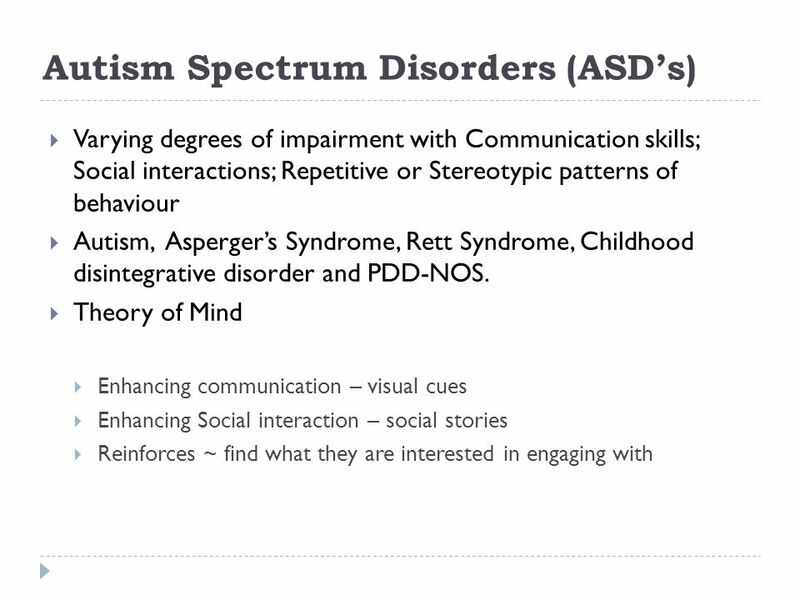 Autism Spectrum Disorders Mary Cantor and Carrie Powers. copyright (c) 2003 Allyn & Bacon Chapter 6 Teaching Students with Visual Impairments, Hearing Loss, Physical Disabilities, Health Impairments, or Traumatic. Cerebral Palsy A presentation by Shalonda Thomas, Chairun Combs, Alan Kauffman, Anthony Nanfito, Robert Scott, and Kathryn Buckles.  Special Guest!  Quiz #2 Collection  Discussion: Chapter 10: Autism Chapter 11: Communication Disorders Chapter 13: Sensory Impairments  Homework for.